High above serene Lago Maggiore and the Italian-Swiss tourist towns of Lugano, Locarno, Bellinzona and Ascona lies the Verzasca Valley. It is hidden in the folds of the craggy Lepontine Alps. This valley is part of the Locarno district in the Swiss Canton of Ticino and includes the municipalities of Mergoscia, Vogorno, Corippo, Lavertezzo, Brione, Gerra, Frasco and Sonogno. To say these are villages is a stretch. If you want to drive from Bellinzona you’ll need grit and nerves of steel to traverse the harrowing mountain switchbacks. Better to arrive by Postal Bus. The ubiquitous Swiss trains are nowhere to be found. And, don't think of driving your own vehicle if you don’t have a designated parking place. We chose the easiest and least expensive option - postal bus. As we traversed up the mountain to our remote location, we felt like we were traveling back in time. Due to its secluded geographical location, invaders never found the valley worth their time or effort to conquer. So the people and culture in many ways have 1 foot firmly in the past and the other tentatively inching forward. In Berzona, a carved rock dating around 600-700 BC known as a Sass di Striöi or witches stone is on a hiking trail. 90 such carved rocks are scattered throughout in the Verzasca Valley. In the European Middle Ages, the population were mainly farmers and ever since the early 17th century, many residents had to leave for seasonal labour outside their home valley. Often unemployed young men were recruited as mercenaries for foreign armies. Our Rustico (stone house) was half a kilometer from Lavertezzo. The so-called Rustici (Italian for farm house) with grey stone walls accented by white borders on the windows and heavy stone roofs, are typical dwellings. The sturdy stone roofs are supported by beams of Castanea sativa wood. Chapels along the way bear witness to the deep faith of the locals. A Rustico often features a religious scene built into the structure in order to secure divine blessings because life here is rugged. 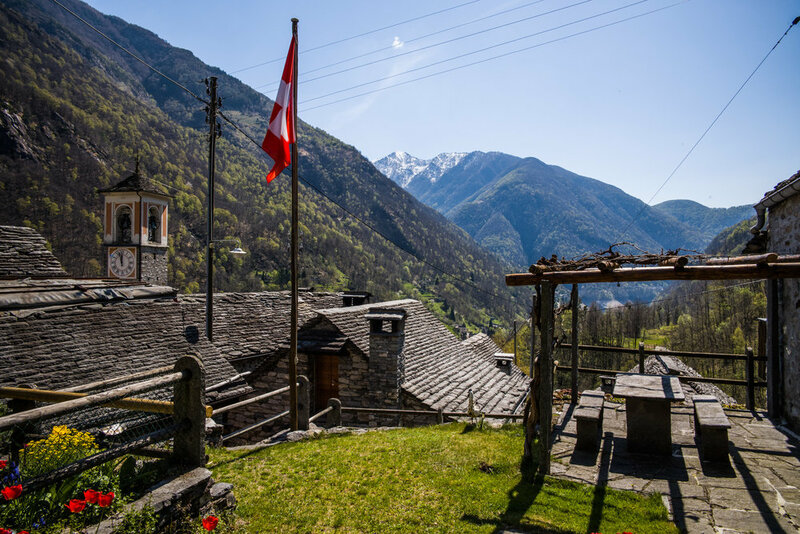 Peace and tranquility are a natural resource in the physically demanding Verzasca Valley. In order to be able to kick back and relax, bring plenty of provisions. The only grocery store is in Sonogno. The store hours are erratic (practically in Italy) and it is closed on Sunday. During the peak summer months, small kiosks open in other towns but after high season, most are closed. 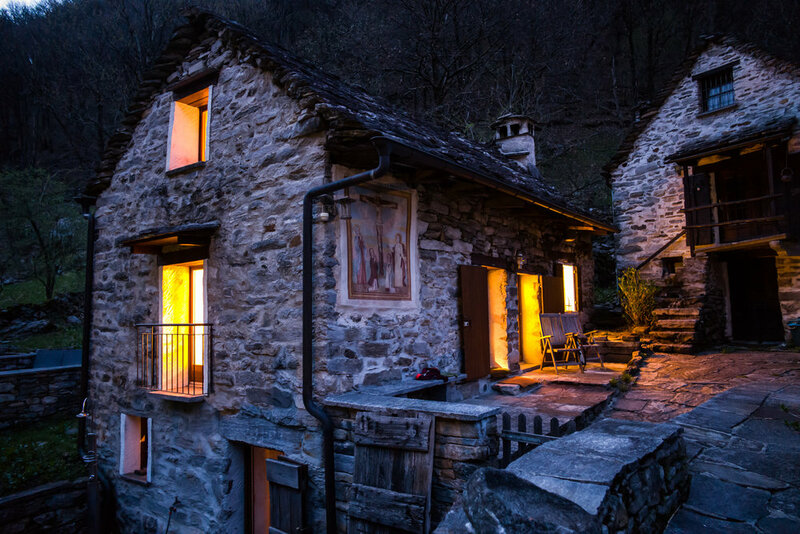 The Verzasca Valley is home to outdoor adventure junkies who trek to this mountain mecca. Climbers, kayakers, mountain bikers and hikers relish the demanding environment. There is no flat ground. Everything is up or down and dramatically so. Serious mountain enthusiasts can join ALPSinsight which hosts a challenging six day ridge traverse. Their “Via Alta Verzasca” program is for fit mountaineers who want to see “what is high above and far more impressive." Thrill seekers can tap into their inner “James Bond” and jump off the Verzasca Bridge! The thrilling opening scene of 1995 Golden Eye was filmed here. The epicenter is a beautiful and practical 400 year old stone bridge. The Ponte dei Salti is a delicate medieval double arched stone structure that allowed foot traffic, carts and small animals to cross the otherwise impassable river. The stone arches float with patient tranquility above the raging emerald serpent below. Stand on the bridge and feel the blue-green river writhing through the rocky gorge, past the stone village of Lavertezzo. The view, location, and experience of Ponte dei Salti attracts outdoor enthusiasts and photographers from around the world. When conditions permit, experienced kayakers float the river. In the late summer, when the river is at it’s lowest, hundreds of people picnic along the river bank and cool off in the water. 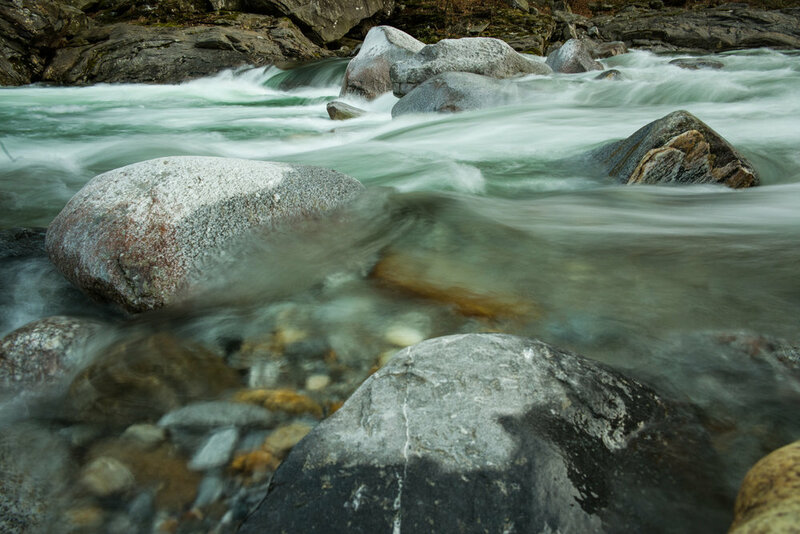 The magical jade green waters of the Verzasca polish the stones of the riverbed and walls. In the spring and summer, snow melt from the Lepontine Alps create dozens of spectacular waterfalls. Across the bridge are the familiar yellow trail markers that are prevalent throughout the Swiss Alps. Hundreds of kilometers of trails wind through the rugged mountains. We hiked the river trail, the Sentiero Verzasca (The Swiss Green Water Trail), for about 15 kilometers. 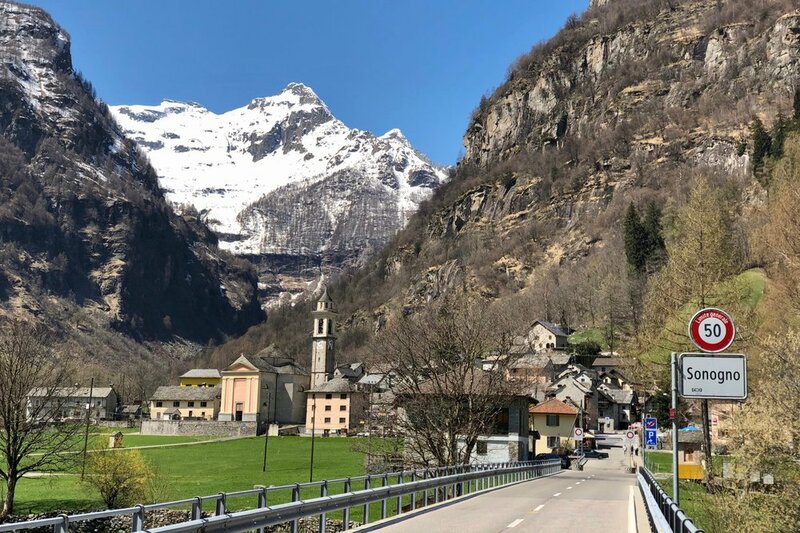 The trail meanders through quiet hamlets and ends at the little village of Sonogno. Check out this hiking video. Sonogno hosts a few small shops, cafes and bike rentals. We explored even further up the valley and discovered waterfalls and creeks along the dirt path and eventually ended up in the village of Cabiói. 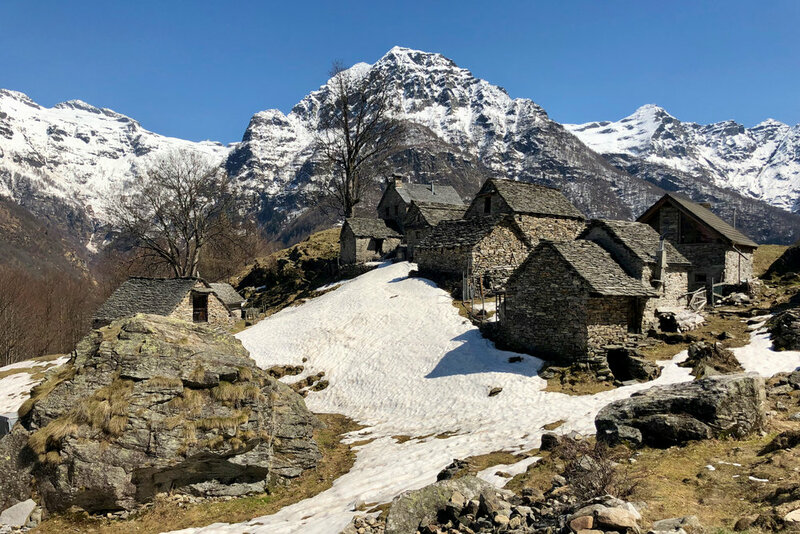 If the Verzasca Valley is remote then the village of Cabiói is obscure. In order to get to Cabiói you go to the end of the road at Sonogno and then continue up the valley on dirt trails a few more kilometers. Cabiói is home to a natural sheep dairy farm. The sheep roam and graze along the grass hills. The sheep’s milk is made into cheese and aged in natural stone refrigerators. These rusticos are some of the oldest in the area and were built around the 1700s by farmers and shepherds to house themselves and their livestock. From April through August, the region suffers an identity crisis. The 20th century saw a revival of the Rustici as a weekend getaway for sea level locals or those with familial roots. About 10 or so years ago, outdoor adventurers began posting photos and videos of the area and the secret was out. Entrepreneurial locals cater to tourists by renting their ancient stone houses and setting up kiosks set on the roadside. This influx of visitors props up the economy but also brings trash, many vehicles and severely stresses the fragile infrastructure. Traffic jams on the narrow roads are common as there is only 1 road in and out. Locals debate how and what to do. Developers are eager to build up the area and have proposed transforming an entire village into an exclusive 5 star destination resort. 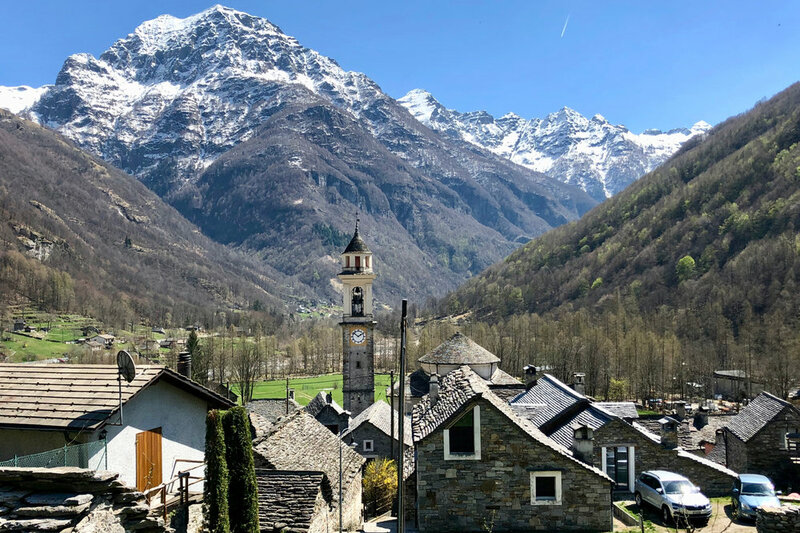 Going up the Verzasca Valley, the village of Corippo springs out almost suddenly after passing the town of Vogorno, in the vicinity of San Bartolomeo. The tiny, stone ghost town of Corippo plans a revival since the former 300 inhabitants and is down to 12 or 13 old timers. Grand plans are on the drawing board to transform the entire stone village into luxury lodging. The majority of guests will travel by bus while the sturdy can hike 1,968 feet above sea level to Corippo. If the townspeople get their way, the village to hotel conversion will take years but will provide many jobs for the locals. With all these hardships why bother visiting? You won’t find 5 star accommodations even though lodging is comfortable and food is local and delicious. But, if you enjoy experiencing a beautiful, pristine alpine river, waterfalls too numerous to count and outdoor activities where sheep likely outnumber people - this place is heaven! 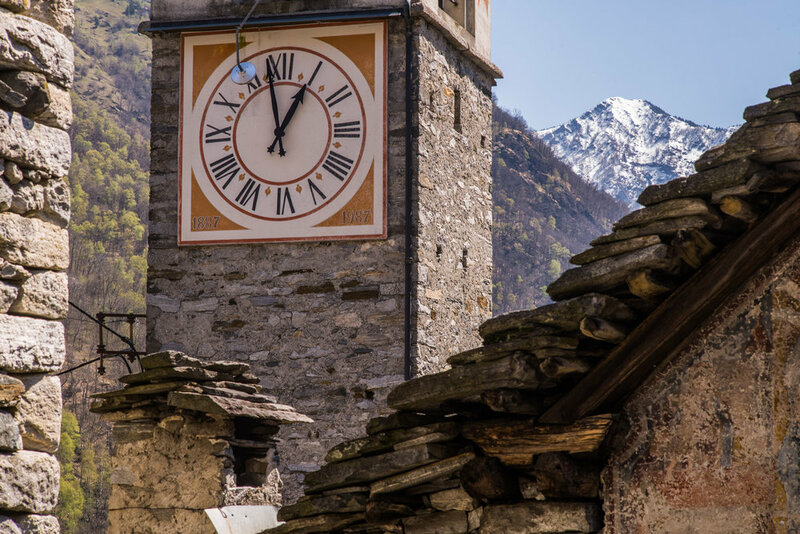 Consider a visit to Lavertezzo and the Verzasca Valley the next time you are close to the Swiss/Italian border. Depending on when you visit, the crowds are either non-existent or near the breaking point. Tip - Be sure to arrive at your final destination during the day. Once the sun sets, there aren’t many lights other than the stars and moon to guide your way. Tip - If you stay a few days be sure to take a photo of the bus schedule at the locations you will frequent - like the store. Google maps does not have accurate info. Missing a bus could mean waiting an hour or 2 for the next one. And do not expect Uber to be available.